A rare away win over Scarlets kept the European Champions Cup door open for Ulster on Friday night. Having last won in Llanelli six years ago, the most recent defeat coming two weeks ago at Parc y Scarlets, Ulster won a thrilling game last night 25-24, securing a try scoring bonus point to thrust them into second place in Pool Four. The teams meet again in Belfast on Friday night and Ulster have all the momentum after an impressive display. 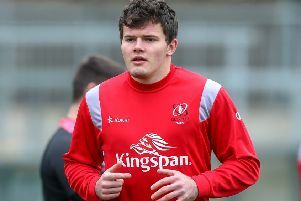 Irish three-quarter star Jacob Stockdale crossed for Ulster’s opening try. His fellow wing Henry Speight, centre Will Addison and number eight Marcell Coetzee also scored, with scrum half John Cooney kicking a penalty and conversion to leave Ulster level on points with Pool Four pace-setters Racing 92. But Scarlets - European semi-finalists last season - are facing an early exit following a third-successive defeat as two Steff Evans tries, a late Dan Davis try, a Rhys Patchell penalty and two conversions plus Dan Jones’ conversion, proved in vain. Ulster head coach Dan McFarland enthused “I am really delighted with that tonight. “Physically we fronted up and that was going to be very important. “This is a difficult place to come and win, but we came wanting to play, we did and we took our chances. “Our defence played a bit part as well, Scarlets have a dangerous attack and we kept them at bay. Our discipline was good and that was also key. “A lot of effort went in by everyone in that win and it was a great victory to be a part of,” he added.